We're not sure how long we can hold these prices but this special buy is time and quantity limited so order today before they're all gone! Unfinished Red Oak Stair Treads - Closed - 1" x 11-1/2" x 36"
Red Oak Unfinished Stair Treads - Standard Box Tread - 1" x 11 1/2" x 36"
Our stain grade Red Oak stair treads are made from 100% solid FAS and Select Grade Red Oak (no thin veneers or finger-joints) and shipped pre-sanded and ready for a coat of stain and polyurethane to be applied on site. All our box treads (for a "closed-type" staircase) have a full round over bullnose along the front edge and are edge-glued for stability throughout the tread's lifetime. If you need a Red Oak tread with a return, see left return Red Oak treads or right return Red Oak treads. Unfinished Red Oak stair treads are sanded and ready for you to apply stain and polyurethane, we also offer prefinished Red Oak treads with our UV top coat applied. Traditional Red Oak stair treads are 1" thick x 11.5" wide x 36" long. 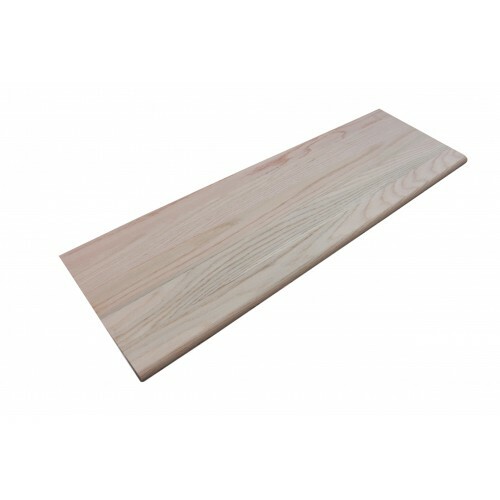 These treads are sometimes identified by their part number - 8070 Red Oak Plain Stair Tread. We manufacture these treads to order (right here in South Carolina - 100% Made in the USA) and complete most orders within a week, but this tread length is a hot mover and is typically in stock. If you have a deadline - please contact us and we'll prioritize your order. Order in larger quantities for a better price per tread and to save on shipping costs. We've set price breaks at certain quantities (noted above), all you have to do is add at least that number to you shopping cart and the price will be automatically reduced. Whether you're a homeowner looking for an economical choice in a quality Red Oak tread or a contractor looking to stock up on a great buy, grab these treads while we're offing these price breaks because pricing is subject to change at any time. These Red Oak treads are intended for interior use only. How much overhang should the tread be on a step. 1 1/4" is the standard overhang on our retro stair treads. Traditional treads will also have a 1 1/4" overhang. Our unfinished stairs are circular and each tread measures 10 1/2" wide at the narrow left-hand side, 16" at the wider right-hand side, are 35 1/2" long, and the 1 1/8" plywood the stairs was made of has a 1" overhang at the outside of it. These stairs go from the main floor that we just installed Bellawood red oak flooring on to the basement. The main floor sheetrock-enclosed walls around it begin with a door to the basement and a very small landing that extends under the door from the main floor on an angle. We are doing it ourselves to keep down costs. Do you sell treads for circular stairs the size of ours? Thank you for any advise you can give us. Thank you for your inquiry. We do make custom sized treads. We would be more than happy to put together an estimate for you. Please contact us direct at 1-866-429-0979 so that we can get the number of treads you need, a shipping address and pictures of the current staircase. Currently my stairs have carpet on them. After tearing up the carpet should I use the "traditional" , 1" thick and 3/4" thick, product or the prefinished thinner pieces? The option of prefinished or unfinished does not matter to me. The traditional treads do not seem to have a "lip" on them at the bullnose for the riser to "hide" under, does this make a difference in how I install them? If you are wanted to overlay the existing steps, then you will want to use the Retro Treads which are the 3/4" thick treads. If you are replacing the treads completely you will want to use the 1" thick Traditional Treads. See the link below for info on Traditional Treads vs. Retro Treads. Do you sell treads square-cut (no bullnose)? I am looking for treads and risers that fit together to create an unbroken sawtooth pattern as seen from the side. Ideally the visible 1" face of the tread (the nose) would be beveled inward by a slight amount and the riser top edge beveled by an equal and complementary amount so as to achieve an effective nosing of about 1". I recognize you probably don't sell this kind of product but do you sell square-cut nose treads? We do sell square-cut nose treads but we will need accurate dimensions of the treads in order to manufacture them. A square cut stair tread is considered a special products so you will need to receive special pricing for this type of a stair. Please provide us with accurate dimensions two Treads are needing and I will have one of our expect staff members prepare the quote for you. The width of this tread is 11 1/2"
You can see the dimensions of the different types of stair treads and stair parts below! How many stringers are needed for a 36" wide stairway? It will have solid risers. Thank you for your inquiry. We specialize in the material aspect of a staircase. Depending on the structure the answer that you are wanting may vary. If you would like to send over some photos I would be more than happy to take a look. I can be reached direct at 678-228-8689 or via email dhyman@stair-treads.com. 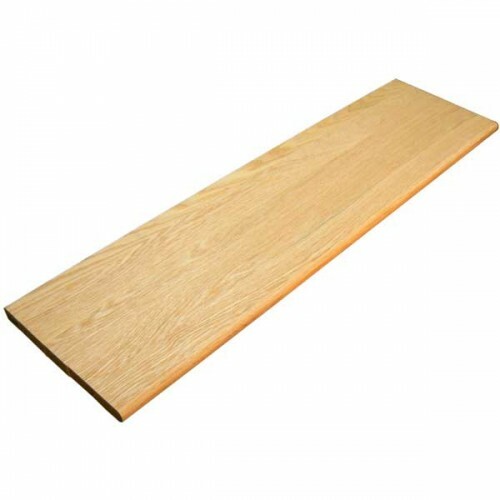 Our oak treads are select grade oak. 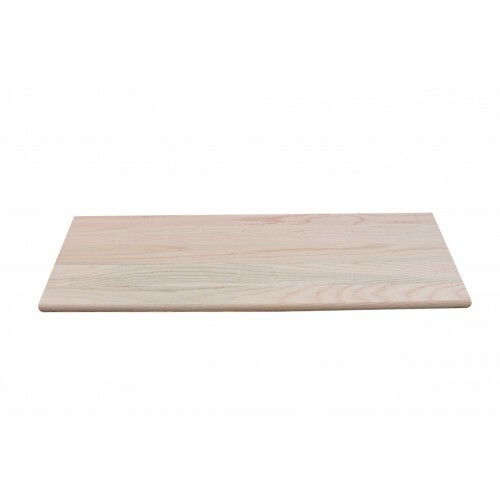 They are great for staining since the mineral and grain pattern is very light.